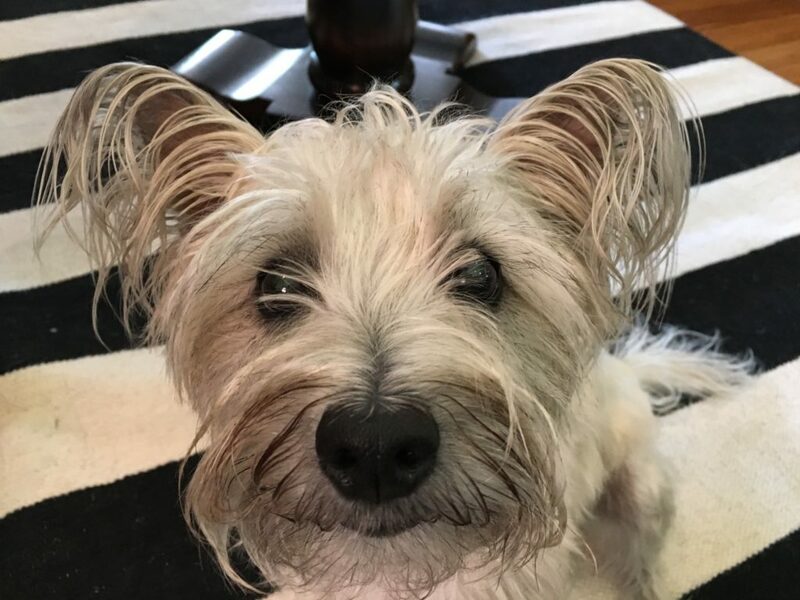 Penny is a two-year-old Cairn Terrier. Her guardians scheduled a dog obedience training session with us to stop her excited urination, stop jumping on people and teach her to listen better. Penny was excited when we arrived for the session; barking with a high pitch and spinning around in circles before we opened the door. Once inside we kept Penny from jumping up on us and refrained from petting her. Petting an animated dog with an excitable bladder is asking for an accident. The best thing to do is ignore the dog until it returns to a calm state, a common theme for this session. When we sat down with Penny and her guardians to discuss her daily routine and behavior, she had difficulty not jumping up on or invading the personal space of any human in the room. I went over a series of escalating consequences that I developed a few years ago and had my apprentice Tara show the guardians how they can utilize these consequences to claim their personal space. It wasn’t hard to see where this behavior came from. Any time that Penny jumped up on or nudged any of the humans she lived with, they promptly complied and petted her. The problem is, each time they followed her suggestion and petted her this way, they were sending Penny a message that she had the authority to tell them what to do. I spent the next few minutes explaining how the guardians can add a little bit of structure to petting Penny to help her stop jumping up on them and transition into more of a follower’s mindset. It’s going to take Penny’s guardians a couple of days to get into a habit of asking her to do something before they pet her. But once they do, every time they pet their dog they will be engaging in a mini dog obedience training session without even thinking about it. By this point in the session it had become clear that a lot of Penny’s behavior problems were a result of her guardians rewarding her when she was in an over-excited state of mind. It’s important to keep in mind that any time we pet a dog, we are rewarding and reinforcing whatever they happen to be doing at the time. Asking the dog to sit or lay down before we pet them helps them feel better about engaging in these activities to ask for attention and makes it easier for the dog to do them in the future. There were a couple of frequent activities that Penny also reacted to in an excited manner. I wanted to tackle each one of these individually so we started out with how she reacted when her guardian leashed her up for a walk. Many of my clients continue leashing up their dog when it starts to get over excited. But the dog’s energy inside the house when you put on the leash is generally the behavior and energy level you’re going to have while on the walk. We repeated the leashing ritual over and over until Penny got the picture and remained completely calm throughout the process. It took us a good 10 or 15 minutes, but by stopping the instant that Penny started to get excited, we were able to communicate to her that the only way we would continue is if she calmed down. As you can see in the video, each time we reset, Penny calmed down faster. The other activity that sent Penny into a frenzy was when someone arrived at the door. I had one of the guardians step outside and play the part of the guest so that I could observe this behavior first-hand. As you can tell, Penny was extraordinarily excited at the prospect of someone new coming into her home. Her guardian added to this excitement and unbalanced energy with the “pizza man” narration. Many people mistakenly interpret excitement for happiness in dogs. But a dog can be happy and calm or excited and not happy. Excited is generally the state of mind that dogs are in when they get into trouble. So helping your dog learn that it needs to stay calm and balanced before continuing can help eliminate a lot of common behavior problems. I had Tara demonstrate how Penny’s guardians can claim the area around the door and control the situation before actually opening it. Tara waited a little bit longer before stepping backwards then I usually prefer. I like to react to the dog as soon as it stops or stands still unless the dogs starts to get distracted by this reactive movement. In that case, then I do wait a little bit longer before stepping backwards. In Penny’s case, I would like to see the guardian moving with sudden, deliberate steps forward and taking two steps back (left foot, right foot only) anytime Penny stops and stands in place or if she sits or lays down on the other side of the boundary. Next Penny’s guardian practiced answering the door herself using the techniques that Tara demonstrated earlier. Because we have practiced this exercise multiple times, Penny was likely alerted to the fact that this was not a real guest by the last rep. That’s why I recommended that her guardians call or text one another when coming home so that they can practice this new door answering ritual. Usually it only takes 6-12 practice experiences before the dog sits or waits behind the boundary on their own. We finished up the session by going outside and doing a little bit of leash training. It seems ironic but conducting leash training without using a leash is often more effective. You just need to make sure that you are doing it in a place that is secure so that your dog can’t run away if it is so inclined. Within a couple of minutes Penny was following her handlers in the heel position without any corrections or the use of a leash. The guardians will need to continue practicing this exercise in 2-3 minute blocks multiple times a day in the back yard, then eventually on walks. To build up her confidence a bit more I recommended that the guardians teach Penny a few new commands and tricks. One of these absolutely should be the stay command. If you’re interested in teaching your dog to stay, you can find the technique I use by following this link. By the end of the session, Penny was noticeably calmer, had stopped invading everyone’s personal space or jumping up on them and was starting to sit in front of whoever she wanted attention from. If Penny’s guardians can practice the exercises and techniques that we introduced during the session every day with good timing, they should notice gradual improvements in Penny’s behavior. By consistently stopping anytime that Penny starts to get excited, her guardians will help her learn that the only way to continue is when she is calm and balanced.